The act of containing is always an act of restraining—holding something or someone in place. Keeping proper control. Limiting expansion. When an infectious disease presents itself, we act to contain it. An act that can be both liberating and traumatic. Contained is an exhibition of installations that encompasses both these possibilities. In 1944, my mother Louise Poulin, contracted Tuberculosis (TB) while caring for her stricken brother and sister-in-law. She was sent to a sanatorium in rural Quebec for treatments that were current at the time – rest therapy and artificial pneumothorax. These treatments involved almost constant bed rest, a healthy diet, hours and hours of fresh air (at times, covered in blankets on a porch in the middle of a Canadian winter), and collapsing of the lungs to cut off oxygen flow to the TB bacteria. For over two years, day-in day-out, she lay there wondering if she would survive while many around her succumbed to the disease. She often dreamed of escaping, flying past the surrounding farmlands, over the grand forests, and into the hopeful sky. My mother’s experience of contracting TB, and the fragility of all life, is the narrative that informs Contained. Illness as a young person, especially traumatic illness, embeds itself deep inside the psyche. It festers and often manifests itself as overwhelming fear. My mother was haunted by such fears and it shaped her identity in the world for the rest of her life. This was apparent in her reactions every time either I or my brothers became ill, and her adamant concerns for proper inoculations and medical tests. Her ever present fear that we might contract TB or another equally terrifying infectious disease made me aware that there was a world of invisible microbes with a potential to suddenly infect or even cause death. 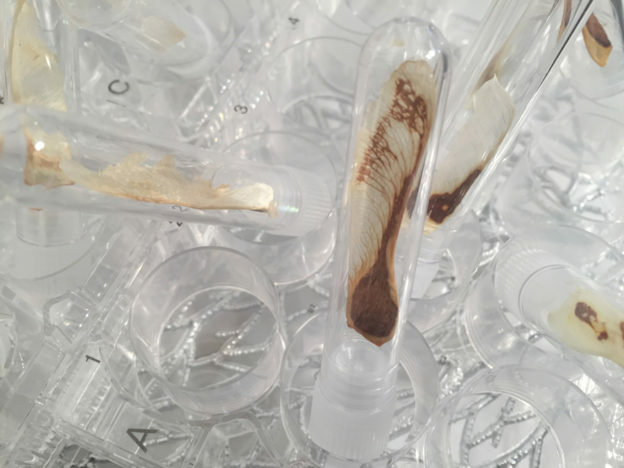 It was only later, when conducting research for my art practice, did I become aware that most microbes are not infectious, are more harmless than harmful, and our symbiotic relationship with them is part of our own well-being. 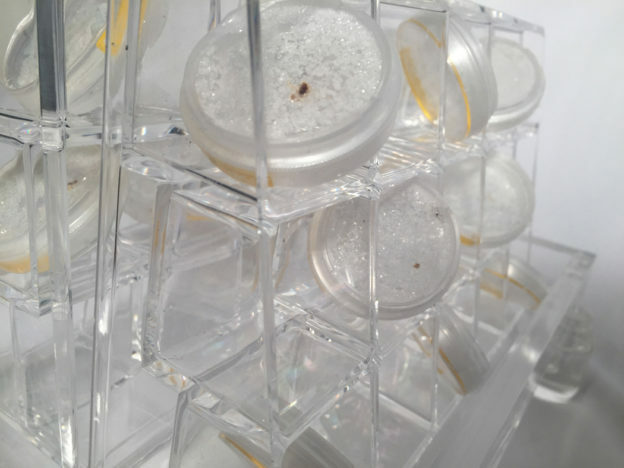 This knowledge – of this necessity and danger – of microorganisms that form our natural and human ecology is a constant in my artwork. Contained, first shown at the Red Head Gallery in Toronto in 2018, is composed of a series of mixed media installations, monoprints, drawings and sculptures. 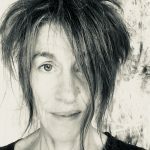 With these works I abstract and transform my mother’s experience of living in a TB sanatorium, to create a gallery atmosphere that is clinical, fantastical, immersive. Drawing on my ongoing artist residency at the Pelling Laboratory for Augmented Biology (University of Ottawa), I combine medical tools and scientific processes into a series of installations and sculptures encapsulating biomaterial, feathers, salt crystals, avian lungs and plant fibre containing human lung cells. She Hungered for the Sky, 2018. 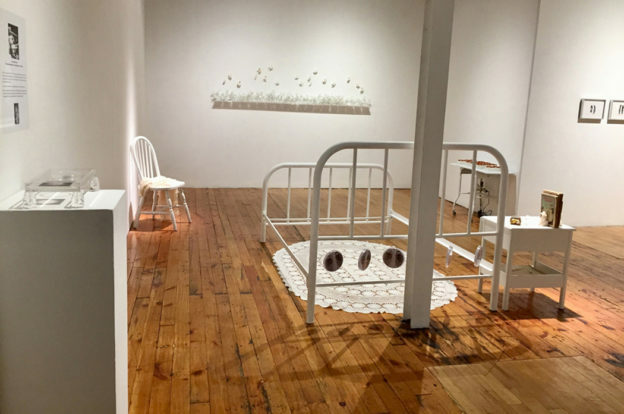 Bed, bedside table, chair, crocheted shawl by Louise while in sanitorium, her books and music piano music sheets, personal items, table cloth, petri dishes with ink drawing and X-ray of lungs with TB (Photo credit: Elaine Whittaker). 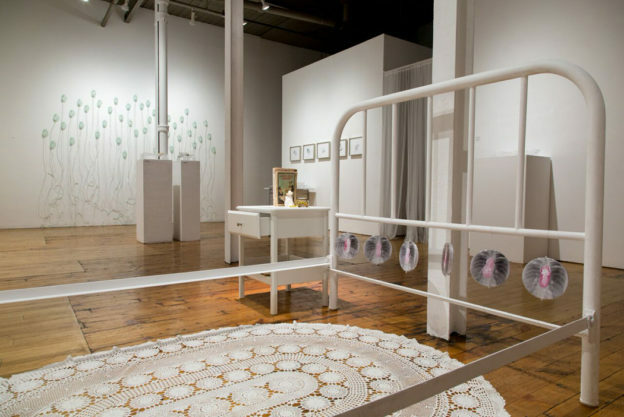 The centrepiece installation, She Hungered for the Sky, recreates the atmosphere of the sanitorium – a white chair with the shawl she crocheted while living there; a bedside table with her books and personal items; and an empty skeletal 1940s hospital bed with attached dangling petri dishes containing TB X-rays and drawings of lungs. 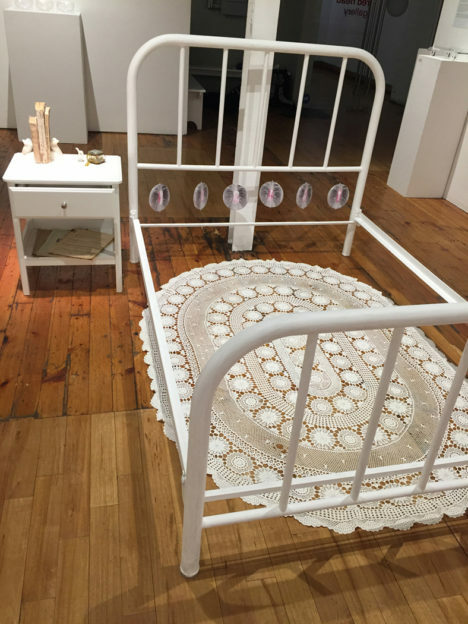 In the centre of the bed frame, laid across the bare floor, lies her favourite crocheted table cloth, metaphorically emphasizing her fragility and confinement. Directly across from the bed is a wall installation entitled Fragile Forest. 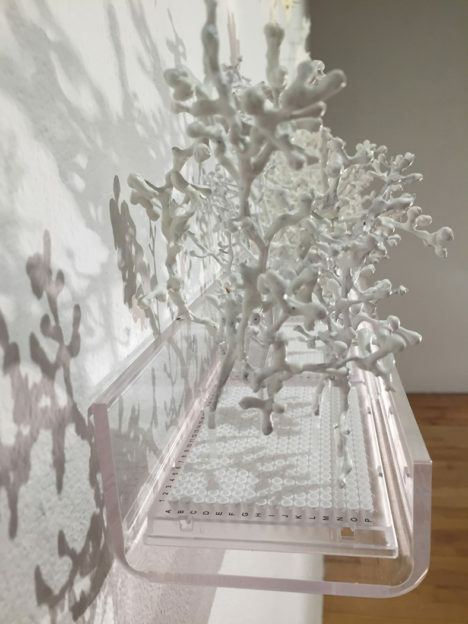 Representing the forest that captured my mother’s dreams and fantasies of escaping her illness and containment in the sanatorium, it is composed of white alveolar-like branches (waxed grape stems) that are adhered to cell culture plates. 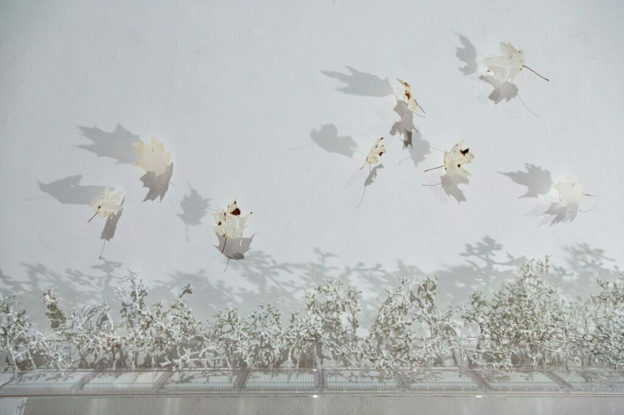 Above them, partially decellularized maple leaves, fragile and spotted like infected lungs, are precariously attached to the wall, fluttering from passing air currents. Decellularization means the plant cells have been dissolved leaving only a cellulose scaffold. 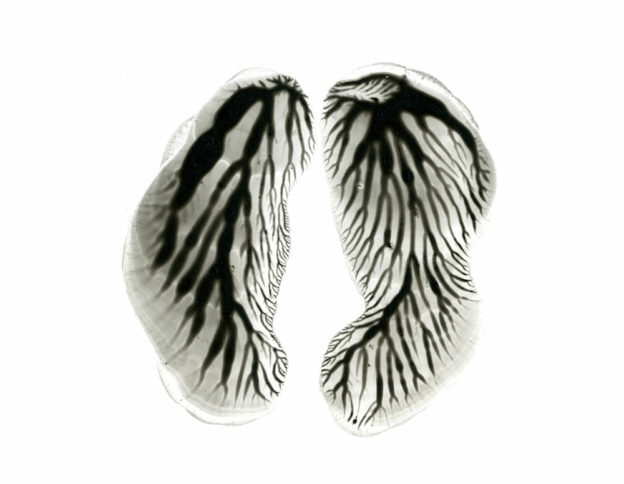 This results in draining their colour, leaving them ghost-like and ephemeral. Lit from below, their silhouettes and that of the forest become even more heightened apparitions. 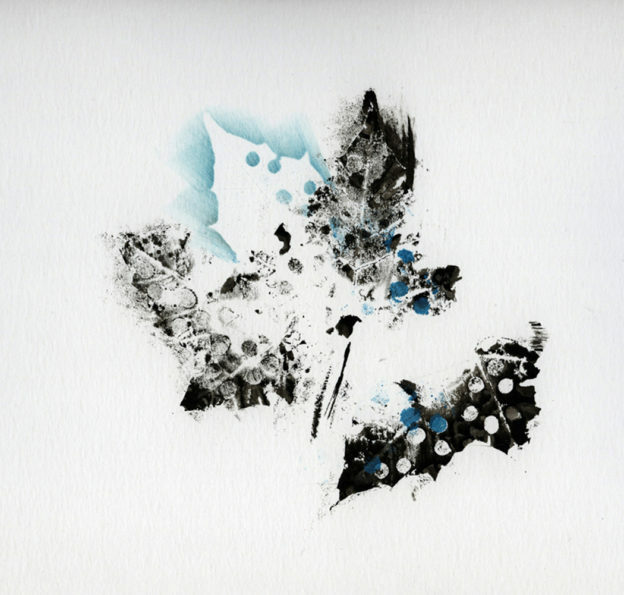 As one moves through the exhibition space, a series of framed monoprints and drawings of leaves and lungs, as well as small sculptures on pedestals, are encountered. These works continue to draw on the metaphors of forest and flight. 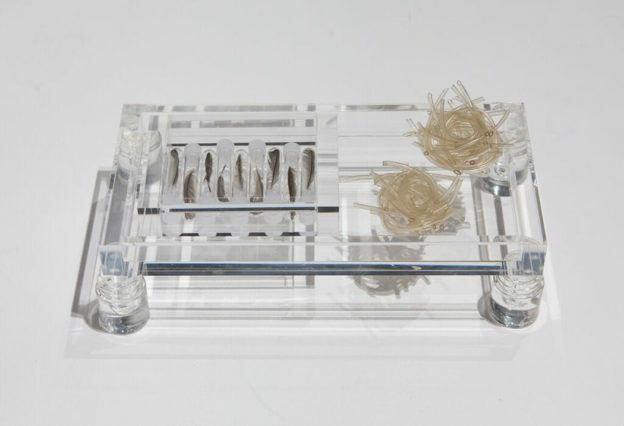 They include test tubes inserted with partially decellularized maple keys (seeds) held in place by cell culture plates and stacked on synthetic maple leaves; sections of avian lung tissue displayed in tiny petri dishes; feathers in vials; miniature nests constructed from medical tubing; and a crow skull. 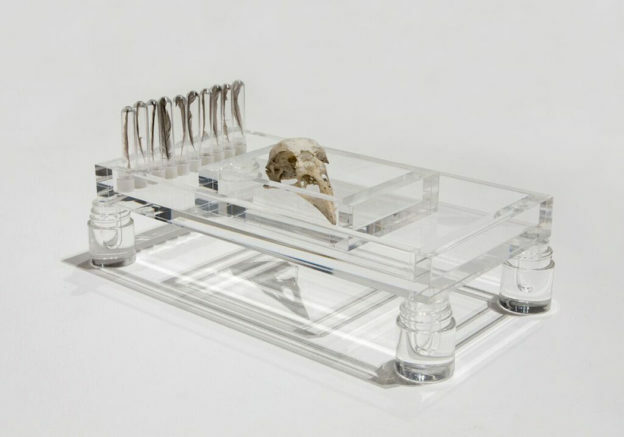 All these objects are carefully placed and contained on clear acrylic bed-like trays. The notion of a confined bird on the edge of expiration and a fantastical forest that heals and provides hope is woven through the artworks. But the reality is that TB is still an infectious disease ravaging the world. 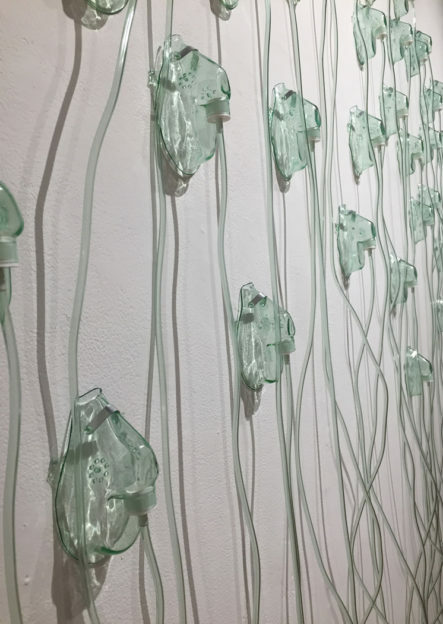 A wall installation of over fifty eerie beautiful oxygen masks lined up with cascading tubes gives prominence to this continuing – even resurgent – plague. These empty ominous masks, entitled Fraught Air, starkly remind us that TB may be out of mind for many people but it is yet to be defeated, known too well by the marginalized in our communities and over the world. The final artwork in the exhibition is entitled Lungs of the Earth*. 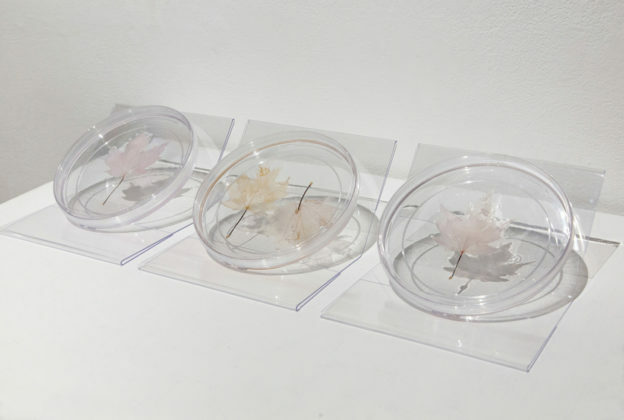 Three large petri dishes with four decellularized maple leaves are elegantly displayed in acrylic holders. Again the decellularization process of removing the leaves’ plant cells has left a ghostly cellulose scaffold, but this time the scaffold has been re-cultured with human epithelial lung cells. 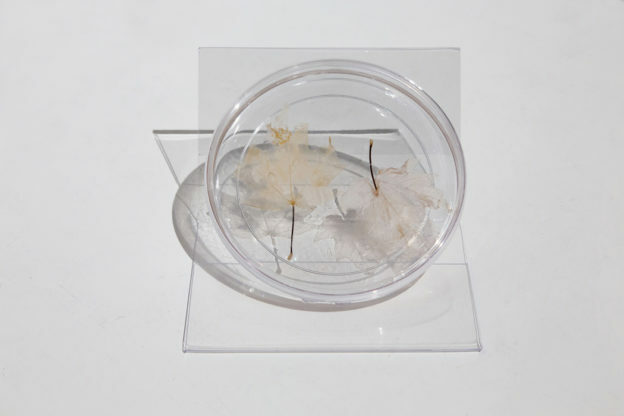 Merging human cells within a plant matrix, this artwork is a convergence of science and technology; a hybridization of human and plant; and a possibility that human and plant can merge. There is a core message of persistence, struggle and hope. 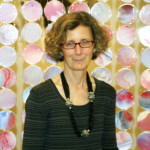 Contained is an exhibit that finds hope when faced with a life curtailed by disease. With its blend of current scientific processes and past medical practices, it becomes, ultimately, a contemplation on past histories and possible futures. 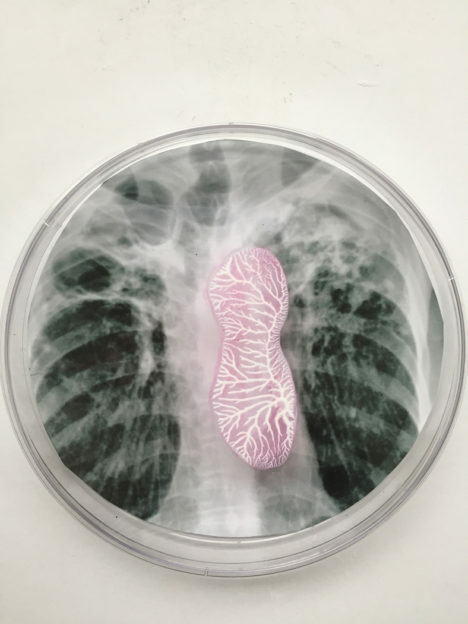 * Lungs of the Earth was made possible through my artist-in-residence collaboration with Andrew Pelling and Ryan Hickey at the Pelling Laboratory for Augmented Biology at the University of Ottawa. It was shown in the 2019 exhibit La Fabrique du Vivant at the Centre Pompidou, curated by Marie-Ange Brayer and Olivier Zeitoun as part of the Mutations/Creations platform.